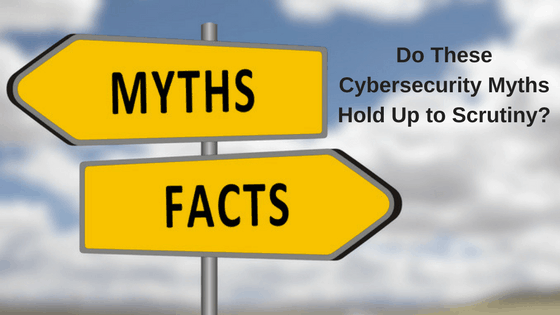 To stay safe in terms of cyber security, you must separate fact from fiction. Hacking and forms of cyber crime are nothing new. However, one recent study reveals the problem is far more severe than any of us thought. According to the Identity Theft Resource Center, almost 178 million personal records were stolen during breaches in 2015 alone. The cost of handling these attacks amounted to $400 billion during the same year – a number that’s expected to climb to $2.1 trillion by 2019. There are many myths surrounding cyber crime. Shattering three of the most prominent ones is the best way to ensure you, your employees and your organization stay safe moving forward. Perhaps the most popular cyber security myth is the idea that if you’re not a large enterprise you don’t have to worry about getting hacked. Many believe that hackers tend to go where the money is, and if you’re running a small or medium-sized business, you’re a small fish in a big pond that probably won’t attract their attention. This is false. The Verizon Data Breach Investigations Report (DBIR) revealed that 61% of data breach victims in 2016 were companies with under 1,000 employees. Hackers are smart, and their attempts are getting more sophisticated all the time. Phishing, ransomware and other hacking techniques target small businesses in particular, as they’re the most likely to NOT have a cyber security plan in place. NOBODY is immune from these and other types of attacks. The more you do to educate your employees and defend against cybercrime, the more you’re likely to stay safe. Myth #2: Cybersecurity Technology Is Infallible and Will Fix Everything. Many people think that if they invest in a cyber security solution, and keep it updated and configured properly, they have absolutely nothing to worry about. Again, this is false. Even a state-of-the-art antivirus suite can’t guard against something like user error. The reason why attacks like ransomware are so effective is that they trick users who aren’t informed about the latest hacking techniques. This is one of the many reasons why cyber security education should always be a primary focus for your organization. Any employee who handles data must undergo security compliance training and understand how to implement security measures. A data-security policy that starts from the top down, and that you strictly enforce company-wide, is essential. Training your staff to identify and mitigate cyber security threats is one of the best ways you can reduce the chance that you’ll be breached. Myth #3: Cybersecurity Is Just Too Expensive for Me to Deal With. Unfortunately, even when a business owner acknowledges that their organization could be a target of hacking, they often believe they lack the funds to properly defend against it. Think about the consequences of a breach. We’re not just talking about downtime and lost productivity – We’re talking about irreparable damage to your business’ reputation, expensive legal fees, damaging regulatory penalties, lost customers, and so much more—all because you want to save a little money. Think about the days or weeks following a potential attack and ask yourself which expense will be larger: The cyber security protections you put in place, or the costs of the points noted above? This could l mean the difference between surviving an attack, and being forced to close your doors. Implementing cyber security measures is a smaller investment than you probably think it is. Cybersecurity Ventures predicts that nearly $1 trillion will be spent on cyber security between 2017 and 2022. Getting on this “bandwagon” today could ensure your business is still here tomorrow. No matter what business you operate, one thing is clear – Getting attacked is no longer a question of “if” but “when.” You must ensure you’re doing everything you can to stay safe.